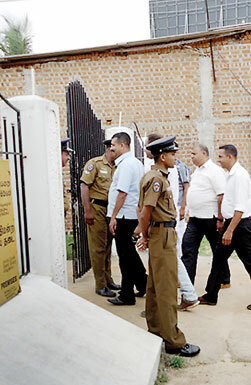 The case involving the attack on DIG Waidayalankara’s son, allegedly by Minister Maithripala Sirisena’s son and 14 others should to be referred to the mediation board, Valaichchenai Magistrate N.M. Riyal ordered on Friday.�This was despite a plea by counsel for the victim Asela Waidayalankara, that the suspects be tried in courts, due to allegations of unlawful assembly, assault and indecent exposure in public. Attorney-at-Law J. Thangavelu appearing for Asela, told court that the police could not give bail to the suspects, when the injured person was in the Intensive Care Unit. However, counsel for the Minister’s son Daham and others said that the Police on completion of its investigations, found it a minor incident, and wanted the matter referred to the mediation board for settlement. �The Police had submitted a report on the incident to Courts. Accordingly, the Magistrate referred the matter to the mediation board and directed the police to submit the mediation board report to courts at the next hearing of the case fixed for June 20.�Mr. Sirisena’s son and the other suspects were represented by 15 lawyers including Mr. Faizer Musthapha.The alleged assault occurred on February 24, when the DIG’s son, along with his wife and another couple were on the beach in Passekudah.